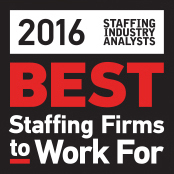 We are honored to be chosen by Staffing Industry Analysts as one of the top recruitment firms to work for. A big shout-out to our super-talented team who make it fun to come to work every day. Click here to find out more. right when no one is looking. Commitment to being disciples through personal relationships with employees and clients. Dedicated to serving our local community through service. USA! Based here and best here!